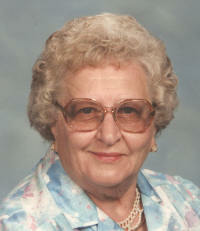 Mary M. Hammer, nee Kniepman, 86, of Trenton, died Sunday, October 12, 2008 at Highland Healthcare Center. Mrs. Hammer was born July 12, 1922 in Germantown, IL to Edward and Philomena (Huelsmann) Kniepmann; they preceded her in death. She married Alfred Hammer on January 14, 1943 at St. Mary Catholic Church in Trenton; he preceded her in death on December 20, 1975. Surviving are her children, Theresa (Tom) Padfield of Trenton, Alfred (Ann) Hammer of Trenton, James Hammer of Trenton, Carol (Ron) Kapp of Trenton, Thomas (Sandra) Hammer of Highland, Jo Ann (Mike) Muston of Flushing, MI, David (Carol) Hammer of Trenton, and Sharon (Steve) Kaufman of Trenton. Sisters, Marcella Brendel of Troy, Anna Litteken of Aviston, , Martha Bellm of Highland, Rose (Bud) Sudholt of Breese, Bernadette (Francis) Lechner of Trenton, Rita Liening of Breese and Jane (Stan) Niebur of Breese. Mary was a homemaker and a member of St. Mary Catholic Church and Altar Sodality, Trenton Senior Citizens. A Memorial Mass will be Thursday, October 16, 2008 at 10 AM at St. Mary Church in Trenton with Fr. Eugene Kreher officiating. Interment St. Mary Cemetery, Trenton. Memorials may be made to St. Mary Church and will be received at the church or through Moss Funeral Home in Trenton who is in charge of the arrangements.